This was originally supposed to be a Christmas Present (Last Christmas) for my soon to be brother-in-law. He and his wife were having a competition to see who would turn on the heat first and I thought it would be cute to give them each a lap blanket to help with the competition. Lo and behold its August and I just got it finished. Maybe next year. The colors are for the Ohio State Buckeyes, which is his team. Her blanket is in blue and white for UK. They’ll have to battle it out again this year. The blanket is the corner to corner that is all the rage in crocheting circles, or at least the ones I belong to. It is pretty simple and the pattern is easily memorized so you don’t have to keep checking the pattern. It is a little warm to make in the summer. I usually prefer squares that are assembled later so I don’t have a warm huge blanket on my lap. Here’s a link to the Youtube video I used to figure out the C2C pattern. About.com also has the written instructions. Off to work on orders and designing Plex. (I haven’t forgotten). I just ran across a picture of this & laughed not only at the name but I just finished a C2C and would like to share the photo with you. 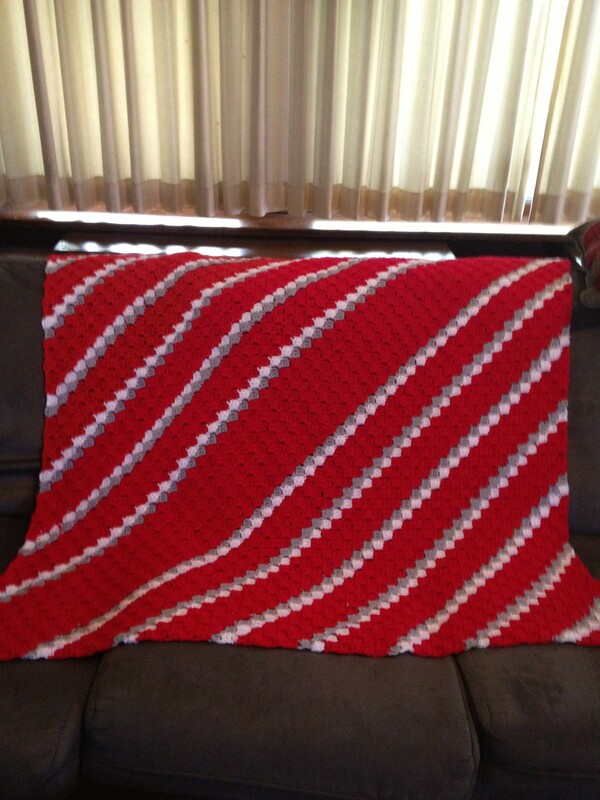 Is it possible to bet a printed pattern for c2c blanket please. I used a video from the crochet crowd. I don’t have a printed pattern for this blanket.